Caption: Workers are wrapping up the German Parliament in silver textile. The work by the Bulgarian artist Christo will be completed on 21 June. 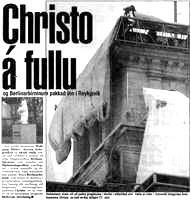 Three German artists, Wolfgang Müller, Karola Schegemlich (sic) and Akodi Hada (sic), took on the task of carefully wrapping the sculpture of the Berlin Bear that stands near the Hljómskálagardur in white sheets, and the action took place on the very 17th of June. It is understood that these Berliners came to this country in order to execute this project, which is to meant to express their sympathy and support towards the Bulgarian landscape artist Christo, who is wrapping up the German Parliament, the Reichstag, right at this moment. On the 17th of June, the Independence Day of Iceland, the artist Christo began his wrapping of the parliamentary building in Berlin. On the same day, three artists from Berlin were here: Wolfgang Müller, Karola Schlegelmilch and Akiko Hada. The artists wrapped up the bronze statue of Berlin Bear in Sóleyjargata. The bear symbolises the friendship between Reykjavík and Berlin. The ceremony attracted a considerable amount of attention of the passers-by, some of whom had their photos taken next to the sculpture. On the 17th of June a parallel action to the wrapping of Reichstag took place. 2380 km away from Berlin, the population of Reykjavik celebrated their Day of Independence. In the middle of the celebrations, Berliner artists Karola Schlegelmilch, Akiko Hada and Wolfgang Müller wrapped up a bronze Berlin Bear that stands in a park at the city centre to symbolise the solidarity between the two capitals. The action was very well received: tourists and locals had their photos taken next to the artwork, some of them in traditional costumes. Great artists get their ideas during breakfast. 2 days' preparation, 20 minutes' production: At the same time as Christo's wrapping of the Reichstag, Wolfgang Müller (ex- Tödliche Doris) and friends wrapped up the bronze Berlin Bear in the park in the city of Reakjavík. A big crowd was gathered in the capital city over there at the weekend, too, albeit to celebrate Iceland's Independence Day. The 80cm-high figure remained wrapped for two days, to the great pleasure of tourists. Müller & Co. did not bother with negotiations with institutions and careful scaffolding. It is true, however, that the Berlin artists paid for the action out of their own pockets (28.50DM). It is not true, nevertheless, that they had to sign 20,000 autographs. 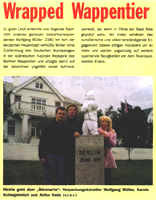 Caption: Wrapped up Berlin Bear in Reykjavík: Wolfgang Müller with assistants. Berliners are everywhere. In Iceland, too. There the Berlin artist Wolfgang Müller (37, ex-"Tödliche Doris") wrapped up the bronze Berlin Bear, on the base of which the exact distance to the German capital is written (1,380km). An action in sympathy with Christo's wrapping of the Reichstag. With the tongue in cheek, of course. The exact details of Müller's wrapping action: Preparation time 2 days. Material: 1 bed sheet, 1 roll of synthetic string. Duration of execution: 32 min. Costs: 28DM. Atmosphere: wonderful. Reykjavík sends its regards to Berlin! At long last we've received the following message from our trusted Icelandic correspondent Wolfgang Müller: 2380Km away from the German capital, in the Icelandic capital, Reykjavík, Müller wrapped up the heraldic animal of Berlin - without permission from the German parliament - and thereby caused as much attention on the geysir island as a bag of rice splitting open in China would. We nevertheless appreciate the artistic and diplomatic commitment of this industrious artist all the more and are waiting impatiently for further exciting news from the fire-spitting isle. Sorry, Wolfgang Müller! In the August issue we wrongly conjectured that no one had paid any attention to your "Wrapped Heraldic Animal" in Reykjavik, Iceland. We are grateful that you have taught us otherwise and sent us this hymn of praise from "Mánudags Pósturinn" (Iceland's biggest and the only gutter press - Ed. ), which we hereby entrust to our readers. And what else is up, Mr. Müller?